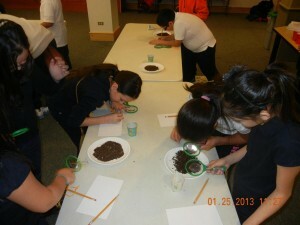 Q: Why would I want to bring my class on a field trip to visit the Waukegan Public Library? A: Field trips are a way to expose your students to new experiences that cannot be recreated in the classroom. Bringing students to the public library connects them to a free resource that can support and enrich their education while providing learning opportunities for their families. If they have never visited the library before, they will discover everything it ha s to offer; if they are regulars, they may hear about a program or service they weren’t aware of. All students will benefit from interactive mini-lessons that tie into the theme of our Early Learning Center. The excitement generated by these learning experiences will follow them back to your classroom, where you can build on the topics and/or skills introduced. In 2013, Bus to Us was awarded the Upstart Innovation Award (sponsored by Upstart, a Highsmith Company, and the Public Library Association), which recognizes a public library’s innovation and creative service program to the community. Learn more about the award at right. A: Bus to Us field trips are fully funded by the Harold M. and Adeline S. Morrison Foundation, which includes the cost of the transportation and curriculum development based on Common Core State Standards. There is absolutely no cost to schools, teachers, or students. Q: When do the trips take place? A: The field trips are offered on Thursdays from 12:30 pm to 3:00 pm and on Fridays from 9:30 am to 12:00 pm. Since bus transportation to and from the library is arranged for you, we are unable to make any adjustments to the timing of the trips. The program runs from mid-January until the end of the school year, then from September until Thanksgiving. A: Your principal will get an email announcement from the library twice a year when we start accepting reservations for Bus to Us trips. Time slots fill quickly after each announcement, but feel free to contact Patrick Toto at (847) 623-2041 x285 or patricktoto@waukeganpl.info to inquire about availability. Q: Why is the program now limited to 1st, 2nd, and 3rd grade? A: We are aligning our goals to “The Campaign for Grade Level Reading,” in tandem with the school district, to offer more resources to positively impact third grade reading scores. Unfortunately, this decision also means that moving forward, we will not be scheduling regular trips for Kindergarten, 4th, and 5th grade classes. However, we anticipate that there will be room for visits for some of these classes depending on the response from 1st-3rd grade teachers and we can contact you if those opportunities become available. If you would like to be put on a waiting list for available dates, please contact Patrick Toto. Q: How does Bus to Us fit in with what I’m already doing in my classroom? A: Bus to Us includes three mini-lessons that are aligned with state and national learning standards, so your students will practice skills—reading informational texts, presenting their ideas, and much more—that they need to succeed in your classroom. After signing up for a field trip, you will receive a letter from the library full of ideas on how to prepare your students so that they’ll get the most from their experience. After your visit, you can use the resources on our website to follow up on topics that caught your students’ attention, ensuring that what they learned at the library is integrated into your curriculum and learning objectives. Q: Can Bus to Us accommodate English language learners? A: Program materials are in English, with the exception of a bilingual letter to parents that the library sends home with every participant. While some program presenters are bilingual, the Library is not able to schedule a bilingual presenter for each field trip. The best way to ensure that ELL students can participate fully is to ensure aides or parent volunteers who can assist with translation as needed. Q: Can Bus to Us accommodate students with special needs? A: The library building is ADA compliant, and with advance notice, the bus company can provide equipment. Please be sure to make any requests for accommodations when you schedule your trip. This small packet contains lesson ideas, booklists, and websites to help teachers follow up on topics covered in the Bus to Us lessons. Go here for more services for schools and teachers. Winner of the 2013 Public Library Association Upstart Innovation Award! 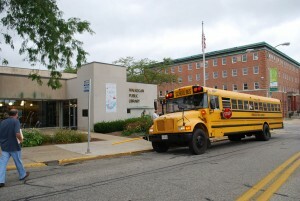 In 2013, Waukegan Public Library accepted the Upstart Innovation Award by the Public Library Association for its “Bus to Us” field-trip program at the annual American Library Association national conference. Bus to Us brings over one thousand elementary school children to the library throughout the year for free curriculum-guided visits. Formerly the Highsmith Innovation Award, the Upstart Innovation Award, sponsored by Upstart, a Demco Company and the Public Library Association, recognizes a public library’s innovative and creative service program to the community.“We sponsor award programs because it’s one way we at Upstart can help make best practices visible. I’m glad other libraries will have an opportunity to learn from [Waukegan Public Library’s] experience through this award, and to build upon it,” wrote Matt Mulder, Director of Education Markets at Upstart. Created in 2011, after the local school district field trip budget was cut, the Bus to Us program gives students a free outing outside the classroom while giving them access to, and a better understanding of, the resources available to them at the public library. In addition, hands-on lessons based on the annual theme of the library’s learning museum educate students on a variety of topics from dinosaurs to water conservation. To encourage repeat visits by the students and their families, each trip culminates with a tour of the Library, a bilingual book bag and encouragement to fill out the enclosed application to get a library card of their own. Bus to Us is fully funded by the Harold M. and Adeline S. Morrison Foundation, including the cost of the transportation and curriculum development based on Illinois State Board of Education learning standards. “We were thrilled by the whole idea of Bus to Us, and how successfully the Library executed it,” said Amy Morrison Heinrich of the Morrison Family Foundation. “The program gave hundreds of children access to vital learning opportunities about the environment—opportunities they would have otherwise missed.” Since the program was implemented, almost 3,000 students have participated in Bus to Us. Waukegan is lucky to have a nationally-recognized resource and community treasure in its library. 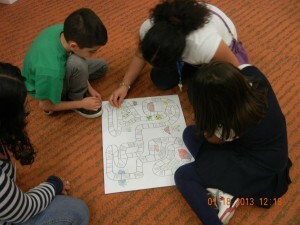 We are so genuinely happy to be able to facilitate access for Waukegan’s public school students to learn about and enjoy the richness of programming, resources and Early Learning Center exhibits that the Waukegan Public Library offers,” said Lois Morrison, executive director of the Morrison Family Foundation.